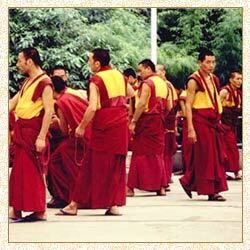 This article provides information about Indian Buddhism. Also find out facts on Indian Buddhism history. Seventh century AD saw the religion permeating entire East Asia and Southeast Asia. The coming centuries witnessed rapid growth of Buddhism in India. Kings as well as wealthy merchants supported the construction of Buddhist monasteries and stupas, over the relics of Lord Buddha. Even in those times, Indian architecture reflected the influence of Buddhism, its art, iconography and architecture. An entire Buddhist university was set up in Nalanda (Bihar), which served as the world center for Buddhist philosophy and religion until the thirteenth century, when the Turkic invaders came to India. With the arrival of Turks in India, the remaining monasteries in plains were also reduced to ruins. That time saw Buddhism, as an organized religion, practically vanishing from India. Bhutan and Sikkim, the only independent Himalayan kingdoms, tribal groups in the mountains of northeast India and Sri Lanka were the only places where Buddhism still thrived. Approximately thirty years later, around 1956, Buddhism again surfaced in India. Dr. Bhimrao Ambedkar, leader of the Untouchables or Harijans in India, adopted Buddhism to escape from the barriers created by the Hindu caste system. He also encouraged his followers to adopt Buddhism. By 1991, the number of Buddhists in India rose to approximately 6.4 million, making Buddhism the fifth largest religious group in the country. The Himalayan communities and Tibetan refugees in India follow the Vajrayana Buddhism, which develop after 7th century AD. Till 20th century, Himalayan kingdoms maintained a hierarchy in which Buddhist monks occupied the highest positions in society. Buddhists in other parts of India follow the Theravada Buddhism.